Poetry must be written in some sort of tradition. Frost's poems take their basic forms from poetic tradition (sonnets, blank verse narratives, irregularly rhymed poems from the Romantics, etc. ), but they differ from many of their genteel predecessors by delighting in ordinary speech and events. His poems strive to wring a sort of homespun wisdom out of the pain, fear, and uncertainty of everyday (mostly rural) life. Frost himself said that the "figure a poem makes . . . begins in delight and ends in wisdom. The figure is the same for love." Such wisdom does not have to be great: it can be something as small as "a momentary stay against confusion" (2). "The Tuft of Flowers" What do you think this poem says about human relations? Are people fundamentally "together" or "alone"? Contrast this poem with "Mending Wall," which, Frost said, "takes up the theme where A Tuft of Flowers . . . had laid it down." "Mending Wall" This poem is written in blank verse. (See Ellmann xlix-lxii.) Why do people build walls? Which lines are repeated in this poem? Why? What do you think it is that "doesn't love a wall"? (Can you connect the poet's name with line 2?) Why do you think the neighbors mend the wall if they really don't need it? What do the images of "loaves," "spell," "outdoor game," and "old-stone savage" add to the poem? What do you think is the "darkness . . . Not of woods only" (lines 41-2) ? "The Death of the Hired Man" Another poem about work and human responsibilities and relations. What do you think of the two famous definitions of "home" on p. 32? In what senses is the farm "home" for Silas? Do you think that Warren and Mary owe Silas anything? Why or why not? Why do you suppose Frost ended the poem as he did? "Home Burial" This narrative poem presents a slice of life. What do you think is the conflict in this poem? How do the husband and wife's attitudes towards death differ? Can this marriage be saved? "After Apple Picking" This is written in lines of varied length with an irregular rhyme scheme. Compare and contrast the attitude towards work presented in this poem with that of "Mowing." The "pane of glass" in line 10 is not literal. What is it? [Note: hoary = "gray or white, as with age."] This story of apples is a kind of parable. What do you think is its meaning? (Note images: ladder pointing to heaven, but good apples strike the earth, "as of no worth.") Name the different sorts of sleep-states described in this poem. What do you think will "trouble / This sleep" of the speaker? "The Road Not Taken" This poem can be read as an allegory of choices we make in life. Why do you suppose Frost stresses the wear and lack of use of each road? What "difference" do you think taking "the one less travelled by" made? "An Old Man Winter's Night" Do you think that this poem has any meanings beyond the desire to present a picture of how old man spends a winter night? Why or why not? "Birches" Compare and contrast how the images of ice, heaven, and earth are used in this poem with how those same images are used in "After Apple Picking." Why does the speaker want to "get away from earth awhile"? Why do you think he wants to come back? Do you think this is a poem about taming nature? Why or why not? "Putting in the Seed" [ere = "before"--an example of poetic diction that many modern poets would avoid.] What do you think this poem says about working with and in nature? What sorts of "Love" could the poet be talking about in line 10? "The Hill Wife" There’s a lot of fear in this series of poems. What do you think the wife is afraid of and why? "Out, Out—" Think of some meanings of the word "spoiled." How are people's fears about death (compare "Home Burial") expressed in the last two lines of the poem? Do you think the speaker agrees with that attitude? Why or why not? "The Witch of Coös" Whose grave is in the cellar? What happened to Toffile? "Directive" Why do you suppose Frost contrasts the "house in earnest" with the playhouse? What could they stand for? How visiting them help make you "whole again beyond confusion"? What "directives" do you think the speaker gives the reader in this poem? Frost, Robert. "The Figure a Poem Makes" 1939. 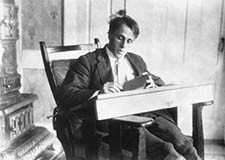 Selected Poems of Robert Frost. New York: Holt, Rinehart, and Winston, 1963. 1-4.